This short section is intended to give a quick overview of the most common problems to be overcome in growing rhododendrons successfully. Controls listed are not the only ones, but they are the ones most commonly available and easiest for the home gardener. Be sure to check the pesticide label for instructions on the use of each pesticide. You must be sure the pesticide is labeled for use in your state or country, for control of the particular insect or disease you are seeing. We do not endorse or recommend any particular product. These diseases are caused by a number of fungi, most of which belong to the genus Phytophthora. 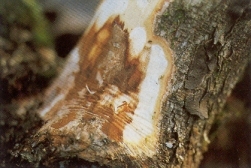 The most common of these to effect the root area is Phytophthora cinnamonia, with Phytophthora cactorum being a frequent cause of dieback of the stems. Many other fungi can be involved such as Pythlum, Botryosphaeria or Phomopsis and others, all of which produce similar symptoms. These organisms are most active in poorly drained soil with much free water, i.e. soil in which you can pick a hand full of soil and easily squeeze water out of it. Puddled surface water around the plant can also splash the infectious zoospores from infected plant debris to the plant above. This is particularly true in the case of stem dieback. So prevention is one of the most important ways of controlling these diseases. Plant high, in well drained soil. Don’t forget that even if a plant was originally placed in a well drained site, the location may not always stay that way. As the humus material around the roots breaks down, the soil will become more dense and compact. With the exception of Phytophthora syringae, most of these rot fungi seem to be more active in warm summer conditions. Good mulching, to keep the roots as cool as possible, may help limit the problem; and good sanitation in the removal of dead leaves and debris under the plant is probably helpful. The use of new bark seems to have a limiting effect on the disease organisms, so the use of new bark in container mixes may be helpful. Container growing is always a problem with root rot diseases because high soil temperature and poor drainage frequently occurs. If you are planting in containers, be especially careful that the container drains well and that the soil mix you are using is very porous. The worst problem with these diseases is that even before symptoms occur it is often too late to save the plant. This is especially true of the root rot forms of the disease. However, on the limb dieback forms it may be possible to stop the disease by spraying with Subdue or other similar chemicals, and by cutting out the diseased limbs. Symptoms of these diseases include wilting of one limb or the whole plant (see illustration at left), much as if you had cut the limb off. There may be yellowing or browning of some of the leaves as the plant can no longer supply nutrients to its top. Particularly in hot weather, this wilting can happen almost overnight and the plant can seemingly be growing well one day and dead the next. Of course in cooler weather the reaction time is slower. 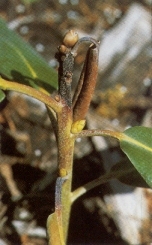 On the limb dieback forms, a browning of the stem, the leaf petiole and midrib of the leaf may occur. This generally happens on new foliage and growth as older foliage is more resistant. The cambium layer and part or all of the woody portion of the stem may turn a deep cinnamon brown. With the root rot forms this browning will occur just below the soil level and gradually move up the stem. The white feeder and larger supporting roots will also turn brown. Example of browning of stem due to root rot. Poor drainage in a field of rhododendrons. Note area in field where plants have never grown. All were planted at the same time and are the same variety.Spraying with metalaxyl (Subdue) or other similar chemicals can be helpful. In hot, wet climates or other conditions conducive to these problems, preventative sprays may be necessary. Most of all, be sure the plant is planted so that it has excellent drainage, is as cool as possible during hot weather, and has good air circulation. Careful attention to sanitation in the removal of dead limbs, old leaves and the like may be helpful. If a plant has died, be sure to correct your conditions of poor drainage, etc., before replanting. It probably is a good idea to put new, clean soil in the immediate hole where the plant has died. Some cultivars are more resistant than others and in areas with greater problems it maybe necessary to select more resistant plants. Not too much is known about this disease. It seems to affect rhododendrons in the coastal areas, such as the Pacific Northwest, the UK and New Zealand, but apparently has little affect in areas where the winter temperatures are quite cold. Some varieties are damaged much worse than others and can be defoliated by the disease. Can be controlled with Benlate or Bayleton. A white powdery material appears on the leaves. This occurs must frequently in the late summer. Since these leaves will fall off anyway, it may not be necessary to treat. Good air circulation helps. Control is the use of Benomyl or similar spray. 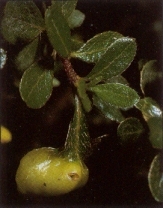 This condition is most common on evergreen azaleas and occurs as a thickened gall on the leaf. It will infect a few rhododendrons causing the leaves to become an off-white or pinkish color and become slightly thickened. If the problem is limited, removing the thickened leaves and burning them may be sufficient. Good air circulation and sanitation is helpful. For best control, start spraying in the early spring with Ferban or Bordeaux. 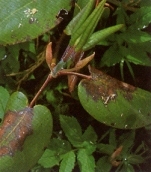 Flower buds turn brown and are covered with black bristles, which are spores from the fungus Briosia azaleae. Remove and destroy affected buds. Fungicide applications are not usually necessary. Factors such as freeze damage (including light freezing when the buds are not dormant), and other unknown factors, can cause the buds to brown and fall off. 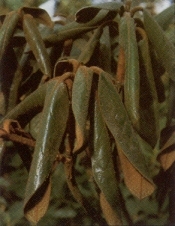 Certain cultivars such as one form of R. wardii will often lose most buds even without temperatures low enough to cause damage. Water-soaked spots appear on the flowers which become soft and brownish. It occurs more as the temperature warms and while there is much moisture. Especially in the southeastern United States, it is often caused by Ovulinia azaleae and is known as ovulinia petal blight. In the northwestern U. S., ovulinia is present, but similar symptoms can also be caused by Botrytis cinerea which is less damaging to the flowers and easier to control. Sanitation is important, so clean up spent flowers and litter around the plant. Spray with benomyl or triadimefon. 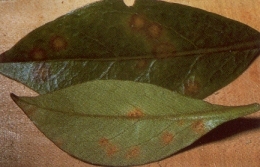 Orange-red pustules containing spores form on the lower surface of the leaf. Control by avoiding those hybrids and species which are very susceptible to rust. Good air circulation is helpful. 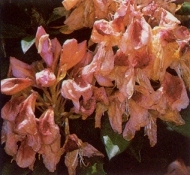 Triadimefon seems to help, but may not be registered for use on rhododendrons. There are a number of leaf spots or burns caused by fungi such as Botryis, Pestalotia, Phyllosticta, Septoria and others. Many are secondary infections happening after mechanical damage or environmental stress, such as sunburn, drought, winter damage or windburn. They generally occur during wet weather and many tlmes are self limiting with drier weather. Good sanitation is helpful, so remove brown and fallen leaves. Also provide good air circulation. Spraying with Benomyl or similar fungicide can be useful, but is frequently not necessary. 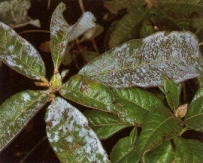 The vast majority of leaf spots that occur on many cultivars, including R. ‘Blue Ensign’ and R. ‘Mrs. G. W. Leak’, are physiological and not disease caused. These spots are generally purplish and are inherent in the cultivar. Environmental stress may increase their appearance. They do no harm to the plant. 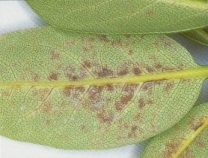 Some leaf spots are caused by viruses, the most common ailment being called necrotic ring spot. The symptoms are reddish-brown rings or spots on the leaves. It generally occurs only on the two year leaves of a few rhododendron cultivars such as R. ‘Unique’, or on Kalmia latifolia. It also appears on the first year foliage of some R. ‘Loderi’ clones. Little is known about the disease and a does not seem to spread from one cultivar to another. No control is known or generally necessary. Leaf spotting can also be caused by chemlcal injury, such as drift from cleaners, paints, or chemicals used to kill moss on roofs. Sometimes the results of such injury may not show up for weeks or months.